Road tests of a vehicle with a difference are taking place at Aberystwyth University. Scientists working on a new attempt to search for life on Mars are testing equipment on a scale model of a rover vehicle, which could roam the planet. 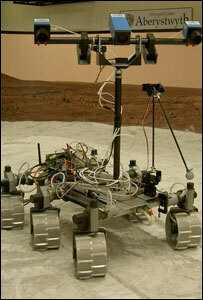 They have simulated the surface of Mars in a lab, as part of the European Space Agency-led ExoMars 2013 mission. A robotic arm for collecting samples and a panoramic camera built by the scientists are being tested. The team also built a robotic arm for the ill-fated Beagle 2 mission, nearly five years ago. Dr Dave Barnes, head of space robotics at the university, said the knowledge gained from Beagle 2's failure was helping the British team working on ExoMars 2013. Fourteen countries are taking part in the project to learn more about the fourth planet from the Sun. Dr Barnes said: "The ExoMars 2013 mission is different in that it is a dedicated mission unlike Beagle 2 which was part of another mission. "ExoMars will orbit the planet and the people leading the mission will be able to decide when and where to land on Mars. "The mission will also have a rover vehicle which will travel between science sites on the surface of Mars." Dr Barnes and his team are playing an important role in preparing the rover vehicle, and Beagle 2's robotic arm, which had five moving joints, is evolving into a more sophisticated arm which will be capable of much more demanding tasks this time around. Under the Beagle 2 system, all commands for moving the arm had to be sent directly from Earth. But it is hoped the arm will work with on-board cameras and acquire rock samples autonomously. In their laboratory in Aberystwyth, Dr Barnes and his team are testing a scale model of the rover vehicle on a simulated Martian landscape, which they call a Mars yard. The ExoMars craft will be launched in 2013 and will arrive at the Red Planet towards the end of 2014.